Trainee Members of the Society for the Study of Reproduction (SSR) include undergraduate students, graduate students, postdoctoral fellows, and M.D.s and D.V.M.s engaged in research training in reproductive biology and closely related fields. Trainee members pay very affordable membership dues that cover access to Biology of Reproduction online, reduced meeting registration fees, lodging, and meeting events, and eligibility for travel grants and merit awards. Most importantly, an SSR membership provides the opportunity to interact with established scientists and with other trainees in the field of reproductive biology. Career opportunities, new scientific ideas and collaborations, and lasting friendships are forged through these interactions. This page is maintained by the Trainee Affairs Committee; please feel free to contact your Trainee Representatives with questions or suggestions. The Society is a member of the National Postdoctoral Association, a "key driver" in postdoctoral policies. The NPA advocates for policy change within the research institutions that host postdoctoral scholars, working with the leadership of federal agencies—such as the National Institutes of Health and the National Science Foundation—to develop new programs and policies for postdoctoral training, compensation, and benefits. Since the NPA's founding in 2003, more than 150 institutions have adopted portions of the NPA's Recommended Practices. Trainee Forum: Presentations and discussions on topics of particular interest to new scientists, such as career development, networking, and ethical management of data. Trainee–Mentor Luncheon: A catered lunch at which trainees interact with established scientists of note in a small-group setting. Placement Service: Post your job search, browse for available jobs, or work for a few hours as a volunteer. Jobs posted at the placement service are sent on to FASEB careers online classifieds after the meeting. This is another great place to browse all sorts of jobs and it is completely free for job seekers. Trainee Affairs Committee Meeting: An open meeting at which all Trainees are welcome. This committee consists of the two Trainee Representatives (elected by the Trainee Membership), other Trainees selected by the representatives and the President of SSR, and faculty advisors. The committee coordinates the Trainee-centered events at the Annual Meeting and provides advice and information to the Trainee Representatives, who serve as liaisons with the Board of Directors. Please see the Committee page for the current committee list. Volunteer at the Annual Meeting: Annual Meetings rely heavily on support from Trainees serving on the Trainee Volunteer Subcommittee (TVS). The TVS provides structured opportunities for Trainees to participate in the Annual Meeting. If you have questions or would like to participate as a volunteer, please contact the Volunteer Coordinators. Committee Representative: Trainees serve on the majority of SSR's committees. Most committees have one or two Trainee members at a time, although the Trainee Affairs Committee is largely made up of Trainees, and the Program Committee tends to have several Trainee members. Committee members are appointed by the President of the Society and/or the committee chairs. An e-mail call for those interested in serving on committees goes out each fall from the President. Please respond if you are interested. Trainee Representative: There are two Trainee Representatives serving at any one time: a senior and a junior serving overlapping terms. Each Trainee Representative, elected by the Trainee Membership, serves for two years. They coordinate Trainee events, attend Board Meetings, and are a valuable liaison between the Board and the Trainee Membership. An e-mail call for nominations for this position goes out each fall, and elections normally take place in March or April. You may nominate yourself or be nominated by another Trainee or Regular Member. Graduate students, postdoctoral fellows, and other Trainees are all welcome to apply. Applicants should anticipate remaining Trainees for the duration of their term in office. Trainee Representatives are expected to attend both Summer and Winter Board Meetings during their term of service. Expenses for the Summer Board Meeting, which precedes the SSR Annual Meeting, are not covered by the Society. However, expenses for the Winter Board Meeting are reimbursed for representatives traveling from within North America and are subsidized for representatives traveling from other locations. Serving as a Trainee Representative is an excellent way to become familiar with the workings of the Society. Please see the Trainee Affairs section on the Committee page for a list of past Trainee Reps. Please view the biosketches of the 2018 Trainee Members who were nominated to be on the ballot for Trainee Representative. The election is held in May. Trainee members will be emailed a link to vote. Session co-chair: Platform sessions at the Annual Meeting are normally chaired by two persons, one of whom is a Trainee. Trainees interested in serving as co-chairs are solicited during completion of the Annual Meeting program. You are always welcome to submit your name to your Trainee Representatives if you are interested in serving in this or any other capacity. Both need- and merit-based awards are available through SSR. These awards assist with travel to the Annual Meeting for presentation of data and recognize outstanding accomplishment. The Trainee Research Awards are available to predoctoral or postdoctoral Trainees presenting at the Annual Meeting. These are competitive merit-based awards given in two categories: Poster and Platform. Eligibility information and other conditions are provided with the abstract submission information and should be reviewed each year, as the exact conditions may change (i.e., dues paid, requirement for an extended abstract). Awards for travel are also provided through various funding organizations to support Trainees presenting at the Annual Meeting. Details on applying for these awards are also provided with the abstract submission information. The Anita Payne Scholarship helps support the cost of travel and participation in the Frontiers in Reproduction (FIR) program. This award is given to the SSR Trainee Member (membership confirmed) with the highest-ranking acceptance into the FIR program. Another useful site for finding a postdoctoral position is postdocjobs.com. "A Fresh Look at Ph.D. Education"
The Council of Graduate Schools (CGS) and National Science Foundation (NSF) co-sponsored "A Fresh Look at Ph.D. Education," a full-day workshop on graduate education. According to reports in the Chronicle of Higher Education and Insider Higher Ed (report), the workshop began with a presentation of CGS Ph.D. completion and attrition data showing that only about 57% of doctoral students complete their Ph.D.s within 10 years. improving the scientific content of graduate education. Lewis Pyenson, dean of the graduate college at Western Michigan University, pointed out that many of the interventions described require significant investments of money and so are not applicable to the majority of institutions in the U.S. that are producing Ph.D.s under intense budgetary pressures. The goal of Professional Science Master's (PSM) is to prepare students for science careers in business, government, and non-profit sectors by combining study in science or math with course work in business, management, policy, communications, law, or other fields. PSM programs, which have been developed with input from industrial employers, offer more science and math training than an MBA and more professional skills training than a Ph.D. or traditional master's. There are 124 PSM programs at 61 institutions. Many of the programs are in biology-related fields, including areas such as microbial biotechnology, genetic counseling, biosecurity, drug analysis, and health care informatics. The programs appear to attract individuals who want a career in science, but who are not interested in pursuing a Ph.D. The America COMPETES Act authorized the establishment of a pilot program at the National Science Foundation (NSF) to provide grants to institutions to create PSM programs. The Act authorized $10M for Fiscal Year 2008 (FY08), $12M for FY09, and $15M for FY10. On 4 January 2011, President Obama signed the America COMPETES Reauthorization Act of 2010 (P.L. 111-358) into law. In March 2008, NSF released an InfoBrief, "Postdoc Participation of Science, Engineering, and Health Doctorate Recipients," based on data from the 2006 Survey of Doctorate Recipients. 45% of recent science, engineering, and health (SEH) doctorate recipients who earned Ph.D.s within 5 years of the survey had completed or were participating in postdoc appointments. This figure is up from 41% in 1995. 57% of life sciences Ph.D.s reported taking a postdoc compared to 50% in the physical sciences, 21% in engineering and computer/math sciences, and 23% in the social sciences. Life sciences Ph.D.s who received their doctorate within 5 years of the survey were more likely to have taken a postdoc (59%) than those who received their doctorate 25+ years earlier (49%). 77% of postdocs with life sciences Ph.D.s are appointed in educational institutions, 12% in government, and 11% in for-profit/non-profit organizations. The primary reasons life sciences Ph.D.s take a postdoc are: to obtain "additional training in doctoral field" (34%), to "work with a specific person or place" (20%), or because "postdoc generally expected for career in this field." 83% of postdocs with life sciences Ph.D.s report having health benefits; 38% report having retirement benefits. 49% of all former SEH postdocs are employed at educational institutions; 41% are employed in business or industry. At SSR's 2005 Annual Meeting, Mark Mirando, Program Director of the National Research Initiative Competitive Grants Program, presented a popular and informative session on grantsmanship. You can download the PowerPoint presentation here: "Writing Winning Grant Proposals: Formulas For Success." 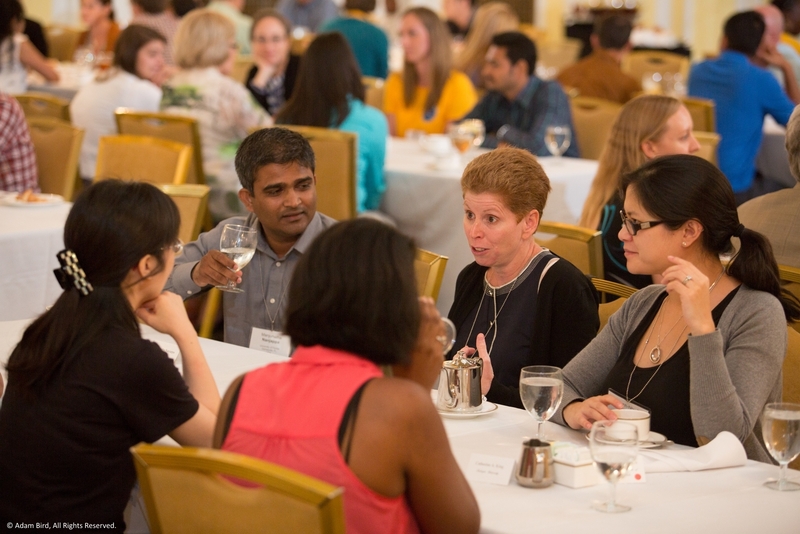 Dr. Jodi Anne Flaws (center) connects with trainees in a conversational setting at the 2014 Trainee-Mentor Luncheon. SSR is dedicated to the development of reproductive biologists in training. SSR is dedicated to the development of reproductive biologists in training. The Fall 2006 desk-to-desk message from Dr. Zerhouni, "Making it Work for our Emerging Scientists," addresses NIH-wide and IC-specific programs aimed at assisting new investigators. Irving Rothchild, winner of the 1994 Carl G. Hartman Award, has attempted to distill 70 years in the sciences down to what he refers to as "an eclectic overview of the practice of science." A list of former Trainee Representatives is available on the Trainee Affairs section of the Committee page.